Tuesday December 11, 2018-NASA Leader Raila Odinga has slammed leaders claiming the war against graft lords is targeting bosses from the Kalenjin community and aimed at derailing Deputy President William Ruto’s match to State House in 2022. 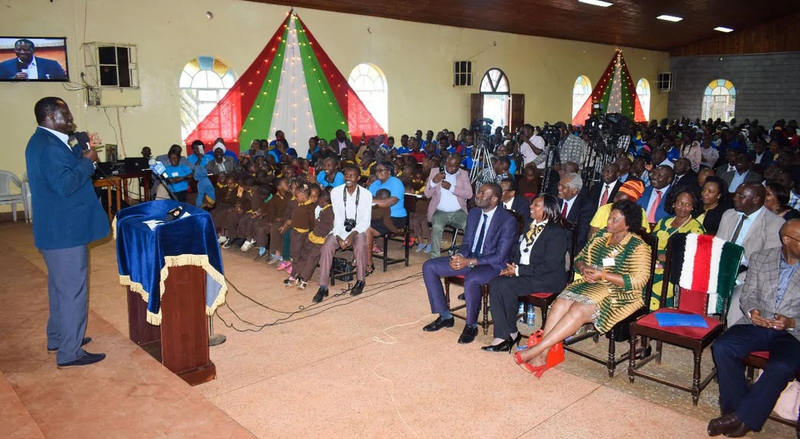 Speaking in Kiambu County on Monday at a Children's Home, Raila said it was time people linked to graft carried their own cross and stopped crying foul. He maintained that the Government was not going to relent in the purge against rogue civil servants who were hell bent to defraud public coffers, saying there would be no sacred cows this time around. “The fight against corruption will continue and I support President Uhuru Kenyatta over this and those leaders saying that it was only one community being targeted should know that those implicated were not employed to work for the community and everybody should carry their own cross,” said Raila. This comes after Ruto’s friend, Joe Sang, was arrested last week for looting from the Kenya Pipeline Company billions of shillings. He has since been sacked as the company’s managing director.